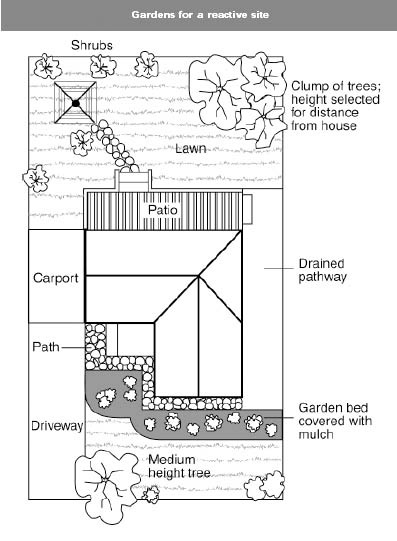 It is essential to remember that the soil that affects footings extends well beyond the actual building line. Watering of garden plants, shrubs and trees causes some of the most serious water problems. For this reason, particularly where problems exist or are likely to occur, it is recommended that an apron of paving be installed around as much of the building perimeter as necessary. This paving should extend outwards a minimum of 900mm (more in highly reactive soil) and should have a minimum fall away from the building of 1:60. The finished paving should be no less than 100mm below brick weep-holes. It is prudent to relocate drainage pipes away from this paving if possible to avoid complications from future leakage. If this is not practical, earthenware pipes should be replaced by PVC and backfilling should be of the same soil type as the surrounding soil and compacted to the same density. Except in areas where freezing of water is an issue, it is wise to remove taps in the building area and relocate them well away from the building – preferably not uphill from it. It may be desirable to install a grated drain at the outside edge of the paving on the uphill side of the building. If subsoil drainage is needed this can be installed under the surface drain. You should regularly check the roof, especially after high winds and storms. The best way to examine the roof is by climbing into the roof-space. Newly dislodged tiles will permit increased light to filter through and the timber frame may show white powder or dark water stains which can be traced back up to cracked tiles. When replacing, repositioning or mortaring defective tiles, always place the back of the foot on the tile joins. A professional may need to be called in if your tiles are too brittle. Professionals should also have spare tiles to replace any cracked ones. Metal roofs can rust quickly once their protective coating is scratched. Pinprick rust holes will show up like stars at night, from your vantage point in the roof-space. Clean gutters regularly. Gutters can rust extremely quickly especially when leaves accumulate. Leaves will pond water in your gutters which accelerates rusting and the action of the leaves decaying may accelerate the rusting still further. A property with overhanging trees may need its gutters cleared of decomposing leaves every few weeks during autumn and winter to prevent rusting. The eaves linings / soffits should be checked regularly for deterioration because animals can peck and chew their way in very quickly. The eaves material can deteriorate over time but often the decay is due to water leaking from the roof or from overflowing or leaking gutters. Gradually warping weatherboards may be caused simply because of their exposure to the elements or the house frame drying and warping. These are not severe problems and normally contain themselves within reasonable limits. However, warping weatherboards and vertical cracks to brickwork may indicate subfloor failure. It is important to maintain a good protective paint or stain coating on all exposed timberwork, otherwise deterioration such as splitting and rotting will occur. In general, most cracking to external brick walls is a cosmetic nuisance only and can be kept in repair or even be ignored. Brickwork will resist cracking where it can. It will attempt to span areas that lose support due to subsided foundations or raised points. It is therefore usual to see cracking at weak points, such as openings for windows and doors. In the event of construction settlement, cracking will usually remain unchanged even after the process of settlement has ceased. Cracks over 15mm wide indicate foundation failure, movement or problems and a structural engineer should be engaged to identify the source of the problem and how to effectively rectify it. The table below is a reproduction of Table C1 of AS 2870. Your roof frame and ceiling rafters can warp and deflect over time but unless the inspector drew attention to a framing fault in the Inspection Report, there is little chance of a serious fault developing. However, if roofs are re-roofed with a material heavier than the original covering, serious damage can occur unless the roof is strengthened. Most plaster walls will crack in time but provided your footings and foundations are sound, generally all that is required is to patch cracks when repainting. Recurring cracks may indicate a structural problem and warrant further investigation. The walls and ceilings in old homes may eventually bulge or sag as the plaster gets older or deteriorates due to condensation and roof leaks. The walls may sound drummy or hollow when tapped. If your house is brick, check the walls regularly for rising damp which is caused by a breakdown of the damp-proof course, compounded by damp external conditions. You should aim to maintain a reasonable circulation of air in the house to prevent stale air, excessive humidity and condensation all of which may affect your health and cause materials to deteriorate. Vapour-producing items such as stoves, clothes driers and showers should all be well vented to the outside of the house. Long periods of stagnant, moist conditions in your house will encourage mould, which can be hard to eradicate completely once it appears. Chloride-based cleaners will scrub most of it off, followed by an application of fungicidal paint for future protection. If outside vegetation is allowed to encroach on the house, it may also encourage damp, dark, moist conditions – so it should be trimmed back. Mouldy conditions are also caused by sub-floor dampness. In buildings with a subfloor void such as where bearers and joists support flooring, insufficient ventilation creates ideal conditions for condensation particularly where there is little clearance between the floor and the ground. Condensation adds to the moisture already present in the subfloor and significantly slows the process of drying out. Installation of an adequate subfloor ventilation system, either natural or mechanical is desirable. Water that is transmitted into masonry, metal or timber building elements causes damage and / or decay to those elements. High subfloor humidity and moisture content create an ideal environment for various pests, including termites and spiders. Where high moisture levels are transmitted to the flooring and walls, an increase in the dust mite count can ensue within the living areas. Dust mites, as well as dampness in general, can be a health hazard to inhabitants, particularly those who are abnormally susceptible to respiratory ailments.